Microsoft is taking another step toward serving workers who aren't at computers all day with a new Office 365 service launched Thursday. StaffHub, which is part of the company's enterprise productivity offering, allows managers to set schedules for deskless workers like retail employees and service technicians. The service is designed to let managers set schedules for and distribute company resources to employees through a simple interface. 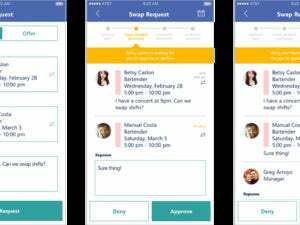 Employees can use the service to swap shifts with one another and chat, too. The new offering is part of Microsoft's push to expand usage of Office 365. While the cloud productivity service has had a strong following among knowledge workers, it has traditionally held less utility for people who aren't editing Word documents and sending emails through Outlook all day. Each StaffHub user, whether they're an employee or manager, will need a subscription to the cloud productivity service. For deskless workers, enterprises can purchase Microsoft's Office 365 K1 plan, which costs $5 per user per month, and doesn't include access to the Office desktop apps. StaffHub is also available through Microsoft's E1, E3, and E5 plans. StaffHub also puts Microsoft in competition with companies like Zinc, which are trying to focus on deskless workers like service techs and retail employees, and which are using Microsoft' historical lack of focus on that sector as part of their pitch. At launch, StaffHub will be available through a web portal, along with Android and iOS apps. Bryan Goode, the general manager of Office 365, said in an interview that Microsoft had worked closely with the customers for StaffHub, and decided to release on those platforms first, but may expand to others in the future. Managers will be able to set schedules for their employees using a graphical interface where they can block out time for shifts and assign particular people to each one on a color-coded calendar. Those schedules are then pushed to employees through the StaffHub mobile app. In the event something comes up, employees can also request to swap shifts with one another. That request first goes to the employee and is then sent off to a manager for final sign-off. Managers can also use StaffHub to distribute files to employees and share links to other company resources through the app. That way, StaffHub can be a central location for employees to access important resources from one place. The software also has its own chat function, so that workers can talk with one another and communicate with their superiors in the same app that they use to check schedules and access company resources. While Microsoft has Teams and Skype For Business, which are other chat systems for Office 365 that it could have implemented in StaffHub, the company instead opted to create a simple chat interface that doesn’t interoperate at this point. In the future, it's possible that could change, but the company is keeping things simple right now. StaffHub is built on top of Office 365 Groups, which means that the system's file management is actually just a front end for a SharePoint site. Administrators who are used to managing SharePoint will be able to handle StaffHub in a similar way, though managers can interact with it using a simplified console. According to Goode, this is a sign of things to come for Microsoft, which will be doing more to make Office 365 useful for people who aren’t traditional knowledge workers. "And so you should expect to see more of us here, focusing on empowering these staff workers, as well as empowering small businesses, which is a separate category altogether," he said.